My Melody arrives on Earth much to the surprise of her rival Kuromi. Together with one of the junior high school students, Yumeno Uta, they decide to protect the dreams of the people with the help of magic. Sequel: Onegai My Melody: Kuru Kuru Shuffle! Onegai My Melody is an anime that automatically touched my heart from episode 1. For those of you out there who like Sanrio (Hello Kitty, Cinamoroll, Kuromi ect) you would LOVE this anime. I say this anime is created more for children but its also ok for older people as well. The story takes place in 2 different worlds: Mari Land and the Human world. The storyline can be a bit boring at times, considering the plot is merely My Melody and Uta trying to stop Kuromi from turning people's dreams into nightmares. The plot of the story takes it's twists and turns as every day the main characters run into more critical situations. The story even involves how Uta is dealing with school life (grades, friends and even a secret older crush). I would rate the art as being good. This anime does not have the best art in the entire world, but since it was designed more for the children audience, the art is wonderful. The main human characters always have great designs no matter what their attire happens to be. I think that the best part of the art in this anime would be the backgrounds and environment. The places in Mari Land are drawn to make someone feel quite happy, whereas when in the "nightmare", you feel somewhat scared. The sound's as in the music used are very cute and creative. The theme song for season 1, "Oto MELODY" is one of those songs that you just want to sing along with when hearing. As for the sound effects, they too are very well done. The majority of the effects come from the "magical happens". When My Melo uses the Melody Mark and Kuromi uses the Melody Key, the sound effects are great. The characters in Onegai My Melody are ones that almost everyone can relate to. The main character Uta is involved in school, tries to learn the violin and has a crush on an older high school guy named Keiichi Hiiragi. Hiiragi of couse is the "bad guy" along with the main antagonist of the series, Kuromi. The relationship between Uta and My Melo as well as Kuromi and her sidekick Bacu are very complex. The interactions between them make the viewer feel an assortment of things. I would say that overall, Onegai My Melody is in my top five favorite animes. For me that is a huge deal considering I have seen more anime than i have taken breaths (lol not really but it is a lot). Onegai My Melody was a joy to watch. It is something I would recommend watching when you just want to laugh at something, or when you are feeling a bit depressed. This anime never ceased to make me laugh or wonder. 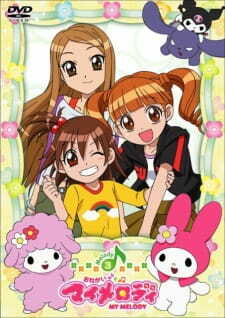 I am currently watching the 4th season of the show: Onegai My Melody Kirara. Onegai My Melody is a long anime, but if you have the time, I assure you that this anime is worth watching.